So I know that Storm was only released like 3 weeks ago, and Elemental was only a couple weeks before that, but can you really blame me for wanting this one like RIGHT NOW?! Nope, I don't think you can! 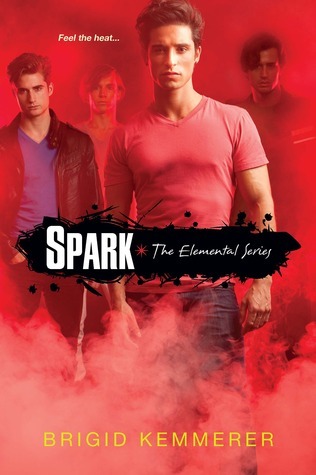 If you haven't read Storm or the prequel novella Elemental, I suggest you do it ASAP! Pre-order it now! You wouldn't want to miss out would you?! I absolutely am in love with Gabriel!! I can't wait for this book! 104 days left but who's counting, right? yes. yes. yes. I want it now!!!! Hey, wait! I haven't read the first one yet. lol So, you're saying I'd better download it and read it, it's good, huh? Maybe I just like red more than blue, but I like this cover more than the first one. I've got Storm but yet have to read it due to exams! Lots of people are talking about it! Awesome pitch - the fuse is lit and I am intrigued! Haha nice one! Make sure you read Storm first if you haven't already :) Plus there's a novella as well! Storm is actually one of the few books I'm planning on reading next! Haha. But I've heard heaps of great stuff so I'm looking forward to it! Yes, you most definitely should read this one next :D Can't wait to hear your thoughts! Thank you for visiting my Wow! Great pic this week btw! I hope you enjoy it when you finally get the chance to read it! :)Have a great week!! I'm pining for this one as well ! I loved Storm and I can't wait for Gabriel's story either. Good thing there isn't a huge time gap between the release of the books. I know right! I love the fact that it isn't a long wait! Have you read Elementals too? Ooh, good choice! I can't wait for this title! That is SUCH a gorgeous cover! I absolutely love all that red! I've heard of this series but haven't read the first book yet. Now I'll be sure to! Huh, I haven't read any of the books in this series, but it does sound really good :) Will check them out! Thank you! Thanks for stopping by and following my blog, it's much appreciated! Second time I've seen this as a WoW today. Really want to read this series. Oh wow! You totally have to read it then :) Hope you enjoy it as much as me! I haven't read the first book in this series yet, but it's on my list! I haven't heard much about it, but what I have heard has been very good! This is one series that I really want to get around to, hopefully sooner rather than later, thanks for stopping by. I LOVED Storm way more than I expected to and I can't wait for Spark! I never read the prequel, but I really need to get around to it! I think I might be one of the very few people who hasn't read any of these books yet! They sound great and I've been reading awesome reviews. I'll have to bump them up on my wishlist. Thanks for sharing! Ooooo great choice! I still need to read the first one. It's patiently waiting for me on my bookshelf :D Thanks for sharing! I need to get a copy of Storm soon, hearing nothing but good things about it and by judging this pick that you loved it. I can't wait got get some swoon XD Awesome pick! I've heard really good things about this one - I'm looking forward to it as well! I've heard really good things about Storm, and actually have it for review, just haven't read it. Glad to see you're very excited for the next book in the series! :) makes me want to get to Storm right now. Nice pick! I've heard Storm is really good. Those boys are soooo cute. Aren't those guys on the cover hot? Man, I think I'll get the book just for the cover. Interesting pick. I haven't heard of this series but I'll definitely be checking it out. Haha! Well, I've had the same feeling on books in a series I just finished reading and were just recently released that I'm dying to get my hands on the next book, so I get you! LOL. Thanks for stopping by my "Waiting on" Wednesday post. oh my gosh! Where the heck have I been? I didn't know that book 2 was on its way yet, lol! Storm is actually in the mail to me right now, I cannot wait to read it! and I am loving the red to this cover! Four very hot brothers with superpowers? What's not to like? I haven't gotten around to reading book one, but hopefully, I will soon. Followed you back, and thanks so much for dropping by. I haven't read this series yet, but it's been getting loads of hype everywhere! Guess I really need to grab the first book when I go to the bookstore again, huh? Anyway, thanks for sharing! I haven't read any of the books in this series, but I really want to! Great pick this week! This is a new series to me. I really feel like I'm missing out though... it sounds great!!! Thanks for sharing! Very nice pick. Thanks for visiting my blog! Hi thanks for stopping by my blog! IF YOU LIKE MY CHOICE THIS WEEK "dARK RETURN" THEN MAYBE YOU WOULD LIKE TO WIN A COPY OF THE FIRST BOOK? I will have that up for a giveaway on the 19th of may be sure to stop by then! This one looks really good. I haven't had a chance to read Storm yet, but have it on my TBR list. I'll be adding this one to. Oooh, this sounds REALLY good! I've still been meaning to get my hands on the first book since I've heard such fabulous reviews. I have not heard of this series. Interesting though. Great pick! I definitely plan on reading Storm soon so I can't wait to start this series. It sounds so good and I love the cover for both books! This definitely sounds interesting! I haven't heard about this series, so thanks for sharing. Great pick! I've been seeing a bunch of posts about this series, I'm very interested in it! Thanks for sharing and followed back!